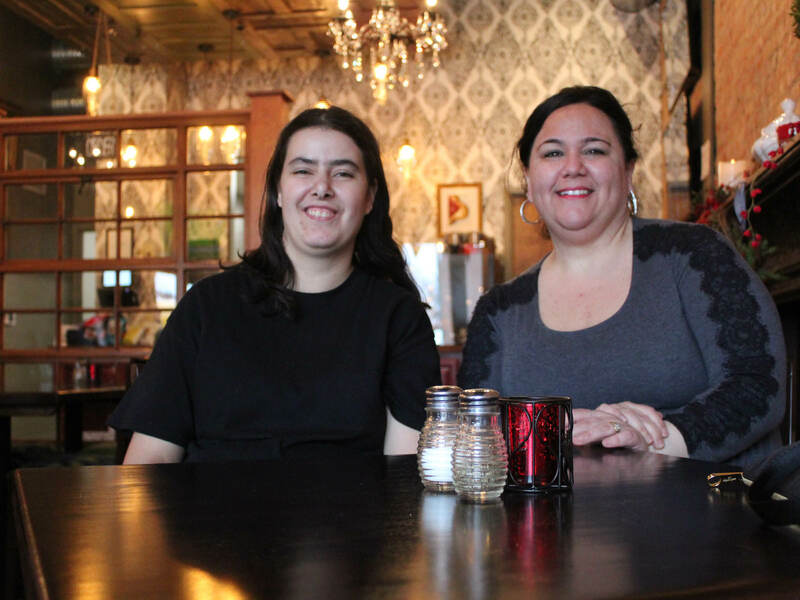 Nicole Herbert, left, whose new job working as a dishwasher at the Union Tea Cafe, has met the delight of Owner Amy Sherburne. A portrait of the Queen’s coronation, crystal chandeliers and a fireplace displaying items from the Victorian era might seem out of place in an Olean cafe. Quite the contrary. The city’s newest business, the Union Tea Cafe and Tea Shop, is a hit with the locals. Offeringmore than 90 different teas and a delightful pallet of English tea pastries along with delicious and healthful American and Middle Eastern cuisine, the cafe is a jewel in the city’s emerging business district. The tea shop and eatery is the culmination of a lifelong dream for its owner Amy Sherburne in a couple unexpected ways. She had always hoped to open her own restaurant and cafe, and to help people. “I’ve always had a passion to cook,” she said, noting she began cooking as a young girl beside her mother and grandmother. And, the artful Lebanese love to help people almost as much as they love to cook. So, cooking and making a difference in someone’s life, someone who needed an opportunity, seemed to fit together. The answer came this winter when they opened their tea cafe, adjoining the renovated OBI building on 301 N. Union St., Olean. Immediately their tea cafe was a big hit in Olean. In fact, it’s so busy, the Sherburnes decided to reserve offering their High Tea for Sunday afternoons in February, simply because their cafe is too busy during the week for the delicate, leisurely traditional English tea. The second part of Amy’s goal was found as soon as Nicole Herbert, who has been with the Employment Connection’s Supported Employment program, came in for an interview.,dressed to start work as a dishwasher right away. “We were impressed with Nicole and decided to give her a chance,” Amy said. 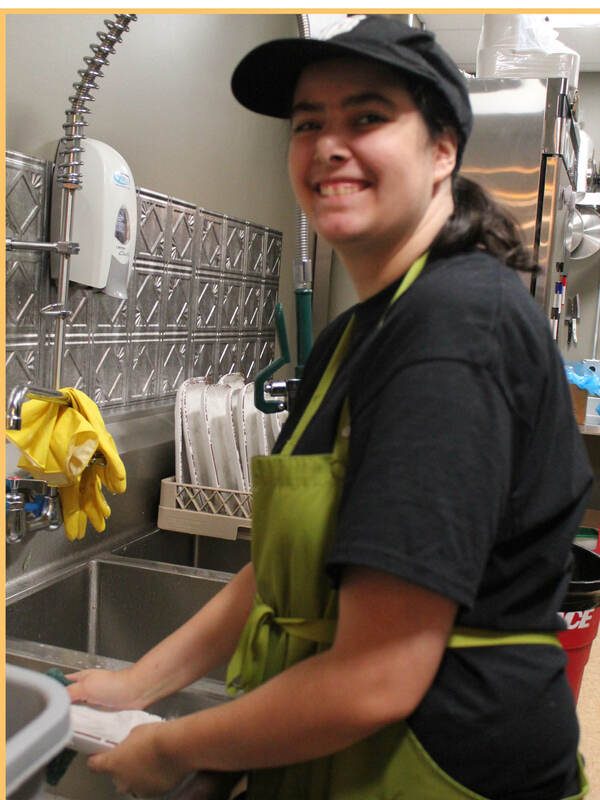 The Supported Employment program, which has 50 people currently employed and 15 job searching, places people in jobs with local employers and provides on-going job coaching to ensure a successful employment outcome. “Nicole is such a great fit, just perfect right from the beginning,” Amy said. “I’m happy to see her come into work. She has a system and does it right. “As a business owner, it can be a challenge to find the right person for a job and when that happens, it’s a great feeling. The Union Tea Cafe is open Monday through Thursday 8:30 am to 6 pm; Friday 8:30 am – 8 pm, and Saturday 8 am – 3 pm. In February, high tea will be offered on Sundays. Stay tuned for more on their website: www.unionteacafe.com.